Uh oh, bad guys from throughout the Jump universe are wreaking havoc right here in reality, and it's up to you and all your favourite anime and manga heroes to stop them. We have no doubt that the story mode in Jump Force will simply act as an excuse to have all of these characters kick the absolute snot out of each other, but seeing so many fighters come together from different properties should still be good fun. 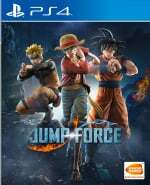 How do you think Jump Force is shaping up? Try not to level the comments section below. @FullbringIchigo Yeah I wasn't expecting much more, to be honest. As long as it's actually entertaining to play through and not a slog I'm sure it'll be fine. On a side note, the Umbra cube they showed in the trailer looks like the Black Box from Nier: A.
Sooooo... a bit like the new Smash Bros story then?! I don’t really care about story mode. As long as the gameplay is fine and has other content then that will be enough. Not sure if I want to take this game online against other people like I do with Smash, Street Fighter V, etc. idk, maybe. Still needs other series in this game. I’m thinking that’s where the DLC will come since the game is close to release.